This award consists of a solo exhibition May 15 - June 27, 2009 and $5,000 cash award. U.S. based artists 19 years of age and older. All work submitted must be available for exhibit. Entries must be received by February 6, 2009. Download submission guidelines and prospectus at www.pelhamartcenter.org or contact rutschaward@pelhamartcenter.org or 914-738-2525. 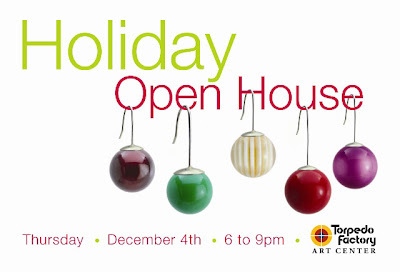 Pelham Art Center, 155 Fifth Avenue, Pelham, NY 10803. DC's Mid City Artists all of which are within walking distance of the Dupont/Logan Circles will be open for visitors with over 20 artists exhibiting this coming weekend. Around 40 artists in one weekend. Details here. Yesterday NPR had a really cool segment on Virginia Museum of Fine Arts' director Alex Nyerges where he managed to weave together a really interesting segment on the museum, a ghost, a Pollock, generous donors and a really strong path forward. I'll be visiting VMFA soon as I'll be in Richmond for a few days later this month and plan to write on the museum and Richmond galleries.